State run total telecom service provider Mahanagar Telephone Nigam Ltd (MTNL) today announced the launch of Nova Navigator, powered by Novatium, for its broadband subscribers in Delhi and Mumbai telecom circles.MTNL Nova Navigator can be used for both Internet access and Computing Applications. The services include comprehensive computing experience with special emphasis on Internet, gaming, digital entertainment, online education, telephony and business productivity. It supports Linux and Windows Operating systems. Novatium provides this powerful, zero maintenance computing service at affordable value starting from Rs 4999/- that comprises of Nova Navigator Console, USB Keyboard and USB Mouse with Nova Computing Charges starting from Rs. 249/- excluding broadband charges for MTNL subscribers and Delhi and Mumbai. MTNL Nova Navigator delivers computing experience which is superior in performance, simpler to use, with substantial savings on investment. MTNL Nova Navigator is an ‘obsolescence-proof computing service’, with all manageability carried out centrally through the server, where the subscriber would automatically get ‘on air’ upgrades totally free of cost from anywhere across the world. MTNL Nova Navigator is a ‘zero maintenance’ access device and is easy to Plug & Play with the comfort at your home or office. Nova Navigator offers enhanced features such as 3G support, plug and play printer support, faster browsing and multimedia amongst others. It has the technical superiority to match up with all software advancements and yet it has the simplicity of an appliance. 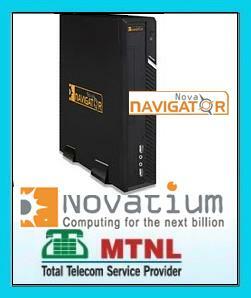 Coupled with its affordability, MTNL Nova Navigator is a one-stop computing solution for almost everyone. Nova Navigator has an option of storing data files either internally or externally or at the server end (remote storage option). Nova Navigator is also available with 160GB Hard disk space for the user to load OS, store applications and software apart from user data files in Internal Storage at a price of Rs.7099/-. External Storage – Users can save data files either in USB Storage devices like Pen drive or External Hard Disk. Remote Storage – Data files can also be saved in the Server for an additional charge. The files saved on the server can also be accessed by existing users from anywhere outside by just logging into the customer portal, nGene. It seems you dont download anything. MTNL is the only ISP in India which offers no Fair Use Policy. With Airtel, with a 512 plan, download 50 gb in a month and your speed will be halved. With mtnl download 150 gb and your speed remains the same. Never had a single complaint in 6 months. Cost of MTNL is also 25% less than Airtel and if you use your own modem you save the entire cost of modem rental. Also, i am on a 512 mbps line but getting 2 mbps for past month. Howz that?